After spending the past few months worrying about how I can’t help where and when I may find a job, how the economy looks, how, even with a Ph.D. I may be out of luck finding a career or how everything seems like its out of my control. I suddenly had a huge surge of motivation and inspiration while reading an article on a different site which was all about ‘Things you learn in your 20s which no one ever told you.’ These lessons had to do with how ‘hard’ life is and how you’ll ‘probably’ never accomplish anything and, while not explicitly stated, that you’ll probably amount to the ‘Average Joe’ marinating in stagnant, complacent misery, forever wondering where the time went. While reading through, I started thinking about how most people I know are pretty down in the dumps and unable to find jobs, meaning, or pretty much anything else. I’ve been having a lot of conversation with people, especially my mother, about how others attribute their locus of control externally, and just give up. Now, locus of control means “the extent to which individuals believe that they can control events that affect them” (thanks Wikipedia) and herein lies the problem. Or at least the ones I have been having with my own personal motivation. Your ‘locus of control’ can be attributed usually internally or externally. Those with an ‘internal locus of control’ believe that they personally have at least some, or a lot of control over the things that happen to them. While, those with an external locus of control believe that they personally have no, or extremely little control over the things that happen. While I was thinking about this, I realized that I have been mostly focusing on the very few negative things I’ve been dealing with and yelling about how I had no control over any of it. This, I realized, was seriously preventing me from taking strides toward my goals as I had been. I started thinking about how much I have accomplished in the past few years like: making friends, moving to NYC, how much I’ve learned, and how much I’ve improved in so many areas. Then I started thinking about how I was taking steps toward my goals and how the only person who could stop me from chasing after them was, in fact, me. I realized that not my license, diploma, birth certificate, nor any other document or object I possess says or will ever say: “Gregory can’t achieve his goals or change the world.” I realized that, if I do in fact want to accomplish something, I will need to take steps toward it and put myself in situations where I can achieve. I happen to be lucky in this regard as I live in NYC where there is a community for just about anything. This is not to say that people in my generation can achieve simply by putting their minds to it. There are a significant number of barriers between us and success. Especially with the economy, oversaturated job market, unreasonable/unrealistic demands and expectations of employers, competition from unpaid interns, need to be an unpaid intern, and about a million other seemingly insurmountable obstacles that stand between 20 somethings and the fabled “non-minimum-wage-job.” Now, more than ever, it seems like the only thing hard work and dedication will get you is a face covered in egg, and while that may be true, we ignore the fact that real success comes from ourselves. Setting goals and taking steps, though they may be small, is the only thing we can do to truly ensure success in this day and age. Throwing yourself body and soul at a barrier and hoping to topple it will only leave you battered and broken. You’ll eventually hobble, depressed and defeated, into obscurity and a cubicle, forever. Now, there is nothing wrong with a solid steady job even if it lands you in a cubicle, especially if it funds your other passions but the key is, you need to be passionate about the things you do. Instead of tossing yourself at a huge barrier what needs to be done is to, as they say, “hit the books.” Do some research, make a plan and execute it. The world, and the last few generations have erected so many barriers that life may seem like a maze. But, with almost the entirety of the world’s knowledge at our fingertips, we can be more clever than that maze. This is how we can achieve anything we try to. Not that it will be easy or quick… but even a toothbrush can clean an entire floor if you’re willing to put in the time and effort. We need to figure out how to chip away at the obstacles before us, and we may only wind up with a little mousehole, but the more mouseholes we put in the easier it’ll be to eventually push the obstacle over. Now back to locus of control. When you surrender to the world and attribute your control externally you may feel like armies are against you, people are either lucky or unlucky, and there is no way to change it no matter how talented you are. But what one needs to realize is that though you can’t control every little thing, such as which opportunities present themselves or come to fruition. What you can control are you and the steps you take toward your goals and passions. Even if it is a one in a million shot, you’ll never make it if you don’t try. Think of it this way: even the greatest, most talented people had to start somewhere. Bill Gates wasn’t born knowing how to program, and Shakespeare didn’t come out of the womb with a pen in hand (though some may argue that fact). Just because you haven’t done it yet doesn’t mean you never can. 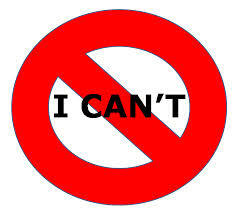 Do yourself a favor, resolve to remove the term “CAN’T” from your life and see how far it gets you.